I am from West Virgina in the United States. 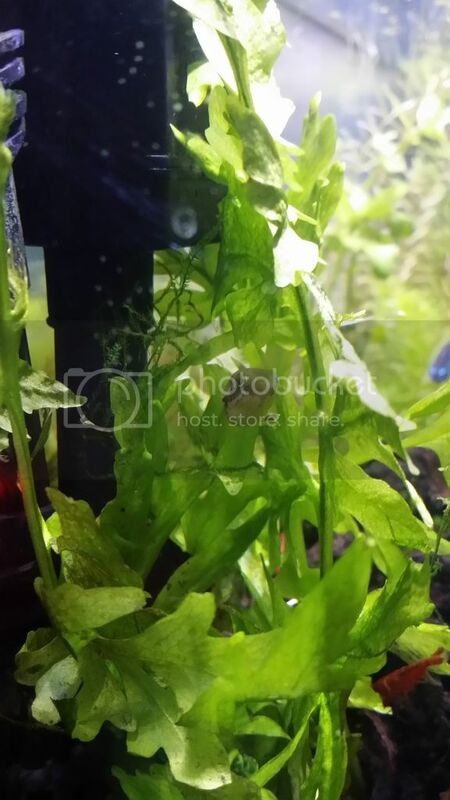 I had a tank when I was younger and about 2 years ago I started keeping them again with planted tanks, the only type of freshwater tanks , with varying types of fw shrimp. 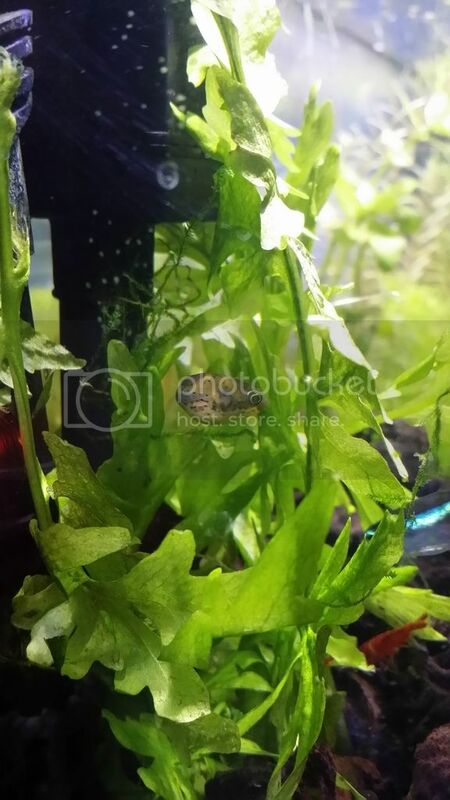 I still love shrimp but I was starting to want to keep something a bit different (besides neon tetras cause my wife likes them as well). I am a dog trainer and love intellegent animals with lots of personality, so of course I found out about the puffer in my reasearch. This is the first online forum that I have ever joined and can't wait to learn so much more about these guys! I had planned on getting a dwarf puffer and set up my extra 10 gallon and started my fishless cycle. 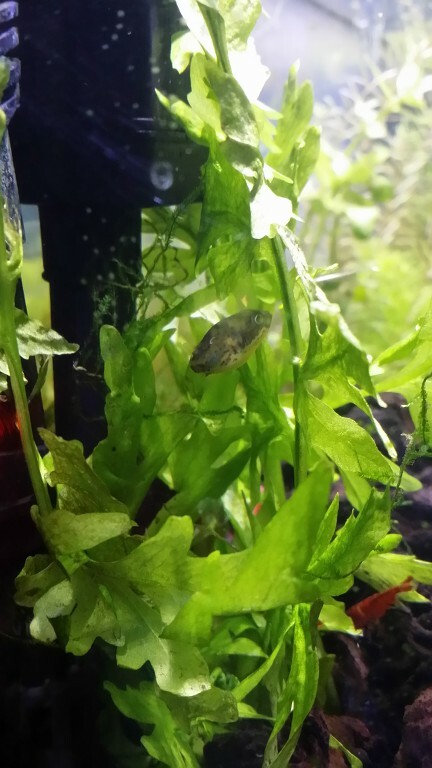 But a couple days later I found one at my lfs and since they almost never have them I decided to get him and put him in my 6.6 gallon tank till my 10 cycles. Unfortunately the 6.6 is overstocked now but keeping up on extra WCs and keeping it tested my ammonia and nitrites are staying at 0 and nitrates are holding between 10-20. Now the question I have is that I can't get him to eat, or at least eat when I see it. I have had him about 2 weeks and I have only seen him eat about 3 frozen blood worms. 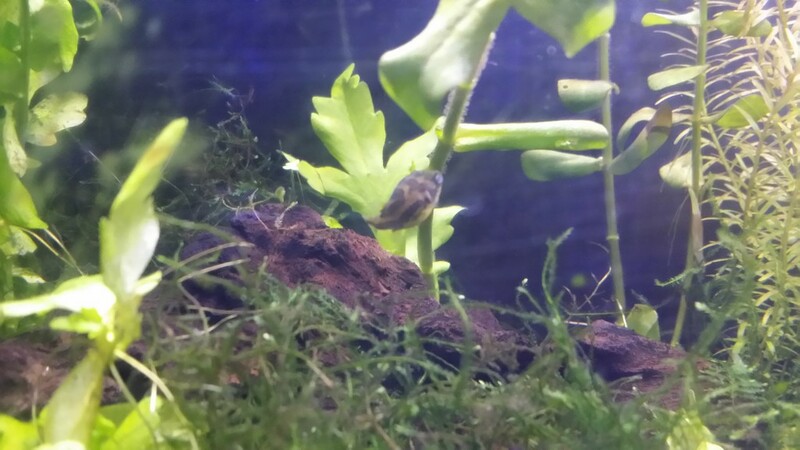 I have put in some bladder and pond snails and while I can't find them, I also can't find the empty shells either. He hasn't been treated for internal parasites. But with me looking around and seeing pictures of dps with them, I don't think he quite looks like that because he is not thin. He looks healthy and is active and his tummy always looks full even though I don't know what he is eating. I have 4 Amanos, and 2 ghost shrimp that stay accounted for. I have tried garlic soaked worms to get him to eat as well. Trying to get pictures for you but the files on the phone are too big. Re: New to the world of puffers and online forums! Unfortunately, Photobucket isn't "user-friendly" anymore. Try Image Shack. That's a very blurry pic. Hopefully these turn out better. Image shack didn't like me copy and pasting the links off my phone so I got on the good ole computer after work. Oh wow. 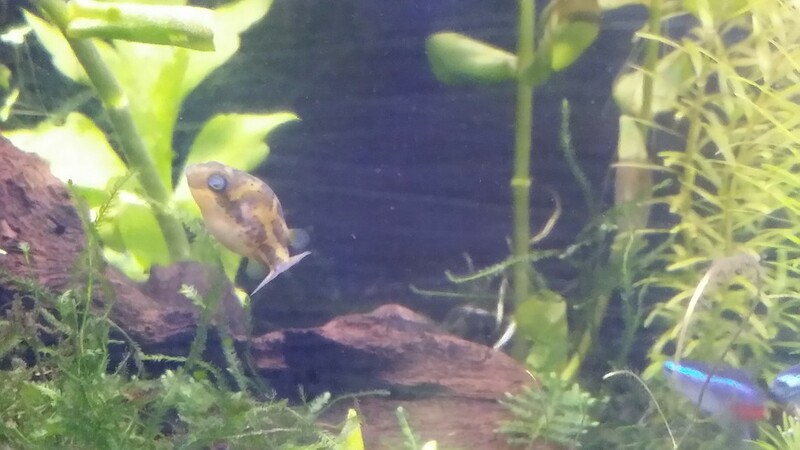 I definitely would trust someone that is a lot more experienced with puffers more than a pet label, because they had it as C. Travancoricus, but what about it makes you think it's a red eye species? 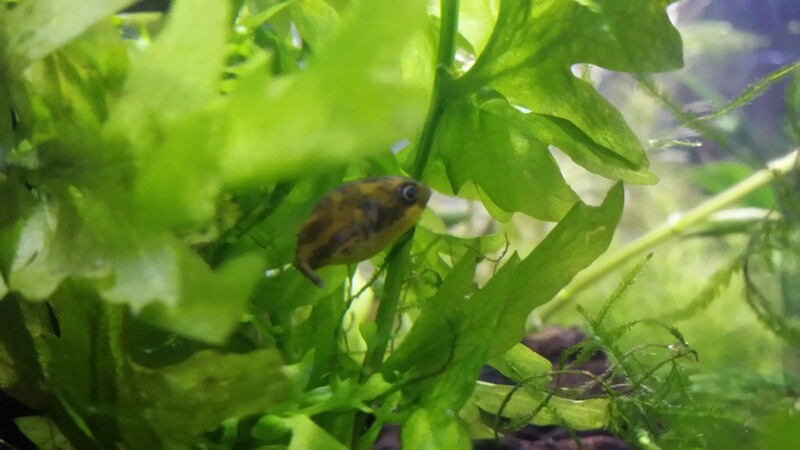 The pictures may not due some of the colors justice, because the first 3 pictures don't quite show off his yellow that well since in every picture he is in the shade of plants. That also includes the last two as well. He also doesn't have red eyes. Do they turn more red as they mature then? Can you get a better clear side view? I will get a better side view when I get home from work. But in the meantime does he at least look like a healthy weight? 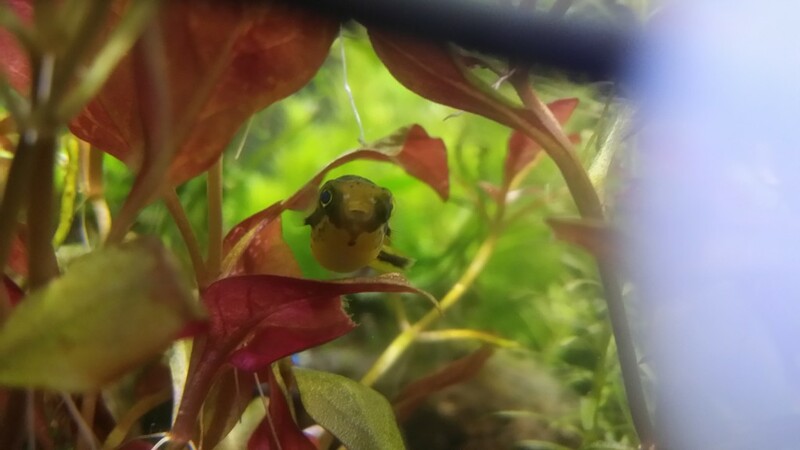 I know it can take some time for them to warm up but he still hides when I come around and won't take any food while I'm there. It has been a bit over 2 weeks with the same behaviour. Since he wouldn't take blood worms in garlic. I have put a drop of garlic in the tank water every couple of days. And during my water change yesterday I did find 4 empty snail shells. I also put about 12 rcs babies in there but who knows if he found them or not. But that's still about 3 blood worms off the substrate and maybe 4 snails and rcs that he has eaten in over 2 weeks. So I don't know if I'm stressing more than needed or not. It really looks like well fed female irrubesco. I would not worry about her starving, not for now at least. In my experience, irrubescos really like blood worms, so it's strange she do not take them...maybe snails are enough for now and she is not hungry at all. 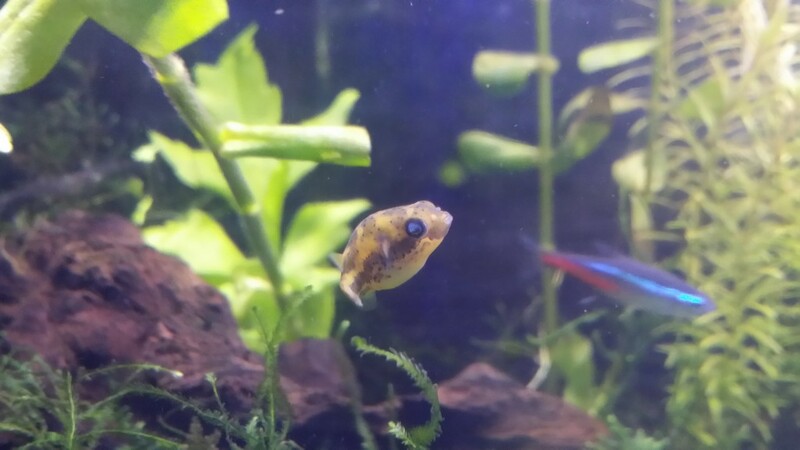 My lorteti had red eyes. It is a fight to try to get a good side picture! 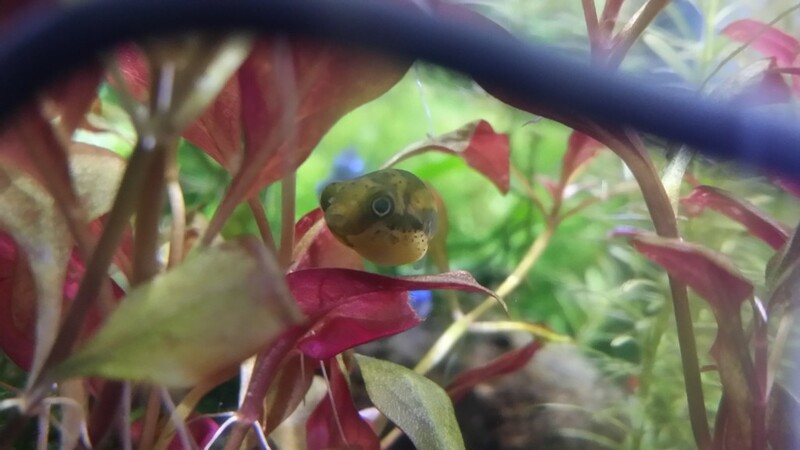 1) because my wife scrubbed the algae off the front of this tank one time and scratched the plastic, and 2) is that it seems to either stare me down or turn and swim away before my phone camera can focus on it. Hopefully these can help it be better identified.